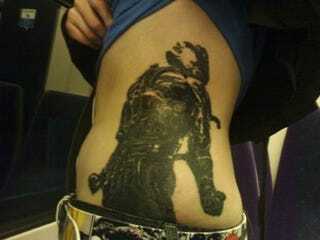 There seems to be no shortage of the impressive art gamers are both willing to pay for and have etched into their skin. Reader Aaron S. - I believe emailing from Japan but I could be wrong - sent us that one, which he says is a picture of his friend. Not him. Because that's a lady that sat in a chair while Solid Snake was rendered up and down her midriff. Wow.